The World Series of Poker has crowned a new Main Event champion. Scott Blumstein of Morristown, NJ was victorious and took home the $8,150,000 first-place prize early Sunday morning. Blumstein beat a field of 7,221 players to be awarded the coveted gold and diamond bracelet. On the final day of play, he beat Frenchman Benjamin Pollak and countryman Dan Ott. Blumstein was first asked how it feels to win the Main Event and with a stunned look on his face he could barely get the words out. "I'm still in shock. I thought I would get even more emotional that what I got in real time but it's just the best feeling, I can't even put it into words." "I'm really happy with how I played tonight," Blumstein continued. "I'm lucky enough to have good resources and hit up a buddy of mine who is really good at heads-up and three-handed poker. We went over what I should do and I was hoping to execute. I think tonight went really well." He spoke with Sarah Herring after all the chips were pushed his way. The final day of the 2017 World Series of Poker Main Event got underway with only three players remaining. 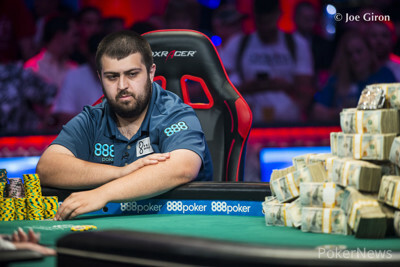 There was the big stack, Scott Blumstein, with over 226 million in chips; the short stack, Benjamin Pollak, with 46 million; and Dan Ott in the middle with 88 million. With blinds starting at 1 and 2 million, there was play for all involved. Benjamin Pollak tweeted he had nothing to lose and everything to win, and that's how he played. The audience in the Rio All-Suite Hotel and Casino and those watching from home, didn't need to wait long for fireworks. Blumstein, who had lost a bit to Ott early on, fired all three streets with nothing but the nut flush blocker on a board with three clubs. Ott had pocket eights with two overs on board and after some tanking, folded the best hand. Blumstein fist pumped and celebrated, Ott shrugged it off. Pollak started getting short, open shoved and got some back, only to raise the river in a hand with the nut flush. Blumstein, who had bet the river, folded the second nuts after just a minute or so in the tank. Blumstein widened the gap and was destined to face-off heads up soon enough as Ott doubled through Pollak. Pollak lost with eights to ace-queen suited and was left with just 12 big blinds. After some confusion over his chip count, the tournament was shortly paused to clear things up. Not long after play resumed, Pollak doubled back up through Blumstein. The two got it in before the flop with Pollak holding ace-three to Blumstein's five-four. Pollak had the best hand but was only a slight favorite. The board would not show any threat to his hand, though, and just like that, he was back in second position. Still, Blumstein had over four times the chips his closest competitor had. As Ott doubled through Pollak with ace-three against queen-ten, it seemed like a heads up match between the two Americans was imminent. 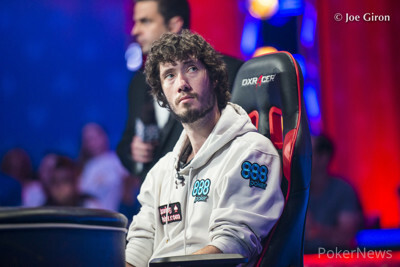 The lone Frenchman was down to fewer than 8 big blinds but tripled up the next hand as he pushed with jack-four suited. Ott called, but folded to Blumstein's isolation shove. If Ott would've called, it would've been a 3-way all in and a double knock out could've decided the 2017 WSOP Main Event. That unicum didn't happen as Ott folded and Pollak tripled up, hitting a jack against Blumstein's king-ten. Six hands later, the unique situation occurred again, and this time Pollak would hit the rail. Pollak shoved all in from the button, small blind Ott moved all in, and big blind Blumstein called to put them both at risk. Blumstein had the best hand with ace-queen up against the queen-ten of Pollak and king-nine of Ott. Ott hit a king on the flop, however, and as the turn and river bricked, he tripled and sent Pollak to the rail in third place. At nine o'clock in the evening, the 2017 WSOP Main Event was heads up and it was down to two Americans fighting for the big money. Guaranteed $4,700,000, there was still a massive $3,450,000 to battle for, and the shiny bracelet flaunting on the bundles of cash in the middle of the table. 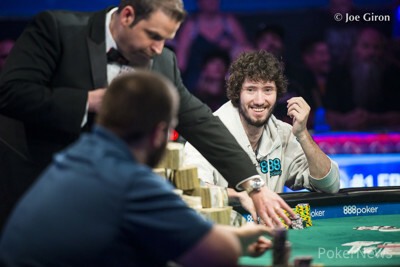 The long heads up match was characterized by conservative play by Ott, while Blumstein appeared to be a bit more at ease with the mano-a-mano duel. On top of that, Blumstein made more hands which made him extend his lead considerably. After 65 hands of heads up, Ott doubled to once again get his hopes up. Those dreams of being able to lift the trophy were crushed the next hand, in hand 246 of the final table the chips went in and Blumstein would come out ahead. Ott was the favorite going in and lead with ace-eight to Blumstein's ace-deuce till the river, but the deuce of hearts hit and the tournament was over. Ott was consoled by his rail, while Blumstein celebrated with his. 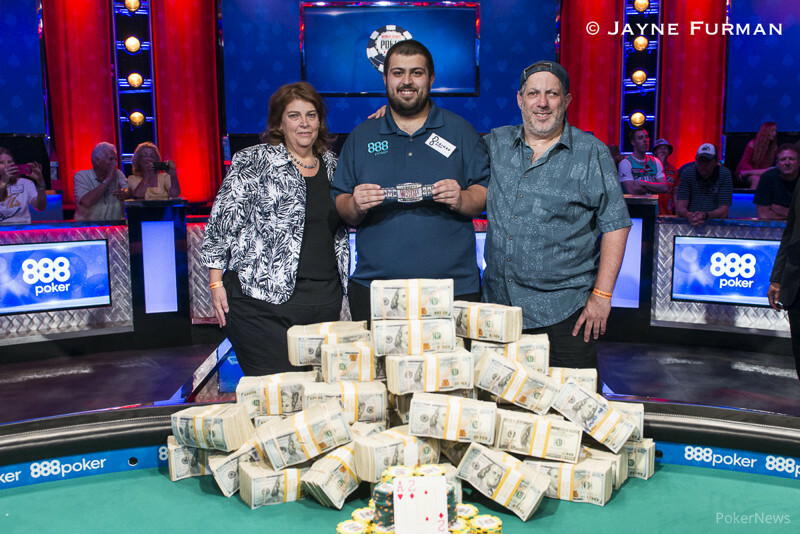 Scott Blumstein was crowned the 2017 World Series of Poker Main Event champion, which netted him $8,150,000. After hitting the deuce on the river Blumstein and his rail exploded. "I mean, is there a better way to win the Main Event, than hitting a three-outer on the river? A normally inconsequential deuce just changed my life. I was mentally preparing for 40 big blind poker but the river was a deuce and the rest is history." "At the end the chips didn’t go my way," Ott said afterward. "The cards didn’t go my way. But I got second place in the third largest Main Event ever. I can’t complain about that." "I’ll definitely be able to play a lot more tournaments," Ott added. "I’m going to come back next year for sure. It was an amazing experience. I’ll never pass this up again. Just keep playing, and try to win next time." If you are looking for Blumstein on the super high roller circuit in the coming years, don't hold your breath. "I don't have an ego in this game. I check my ego at the door. Just two weeks ago I was a New Jersey online grinder and nothing has really changed. Having the money, am I going to play a little more live poker? Probably. But I'm probably going to choose where I go based on location and what works for me as opposed to the buy-in of the tournament." With over $8,000,000 in his pocket now, the big question was what will you do with it. "Money doesn't really motivate me, it doesn't drive me. I didn't want to win this thing for the $8 million, but with that being said it's nice to have some freedom now. The goal was to get to a point where I can do whatever I want to do. And I think I'm going to have that opportunity now whether it's poker, business, going back to school. I have the freedom to do that now. That's the american dream in my eyes and finding happiness is part of that. What a good way to get there." The 2017 World Series of Poker has come to an end. A winner has been crowned in all of the 74 events. Nipun Java and David Bach took home 2 bracelets each. Liv Boeree and Igor Kurganov, John Racener, Chris Moorman, Christopher Frank, Dmitry Yurasov, Max Silver, James Obst, Mohsin Charania, Jens Lakemeier, Tom Koral, Elior Sion, and Chris Klodnicki were just a few of the players that won their first. Doug Polk, Bryan Yoon, Jesse Martin, Abe Mosseri, Mike Wattel, Frank Kassela, David Singer, Adrian Mateos, John Monnette, and several others added a shiny ornament to their collection. The 2017 WSOP player of the Year race is anything but over as the World Series of Poker Europe in Rozvadov later this year counts as well. The American part of the competition is over though, with Chris Ferguson (898.46 points) earning the provisional honors and the €10,000 WSOPE seat. Scott Blumstein out dueled Dan Ott to capture the 2017 World Series of Poker Main Event and the coveted gold bracelet. Photos © Jayne Furman & Joe Giron/pokerphotoarchive.com. Hand #246: Scott Blumstein limped in on the button and Dan Ott raised to 8 million. Blumstein moved all in, putting Ott to the test for his remaining 55.5 million chips. Ott went into the tank and called after about a minute. Ott was the player at risk, but he was well ahead with a bigger kicker than Blumstein. The flop came and Ott remained ahead, along with finding two under cards to lessen the chance of a chop with Blumstein. The turn was the and Ott picked up a straight draw. 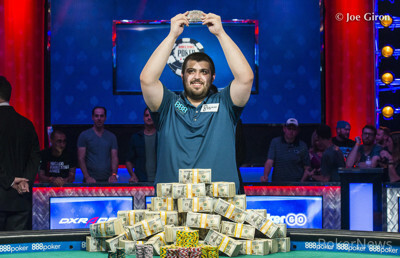 The river was the and Blumstein's rail erupted as he hit a miracle card to lock up the pot and win the 2017 World Series of Poker Main Event. Ott headed to the rail to be with his supporters, and is the runner-up for $4.7 million in his first-ever Main Event. An extensive recap will follow shortly, along with a winner interview and reactions from the runner-up. In the meantime, PokerNews caught up with Ott, who shared his thoughts on the day. "I lost some big pots early so my strategy was to keep playing my game — the same game I’ve been playing for 15 days now. At the end the chips didn’t go my way. The cards didn’t go my way. But I got second place in the third largest Main Event ever. I can’t complain about that." "I started making a few light shoves. I thought it was an alright hand. It might have been a bit too loose but I went for it and happened to win it." Heads up play didn't go Ott's way, as Blumstein dominated most of it. For Ott, it was simply a matter of the cards. "I wasn’t getting any cards heads up if you see the broadcast you’ll see that. I tried with what I had and I can’t complain at all." As far as what this big score means for Ott down the road? "I’ll definitely be able to play a lot more tournaments. I’m going to come back next year for sure. It was an amazing experience. I’ll never pass this up again. Just keep playing, and try to win next time." He spoke to Sarah after the last hand was dealt. Hand #243: Dan Ott moved all in for his final 32 million, and Scott Blumstein released his hand. 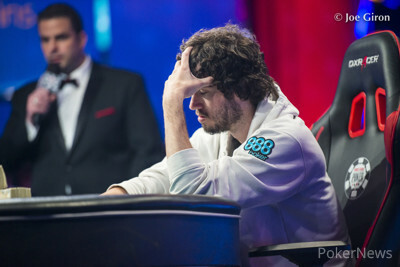 Hand #244: Blumstein moved all in on the button, and Ott looked at his cards, then folded. Hand #245: Ott limped in on the button, and Blumstein moved all in. Ott flashed a smile, then made the call. The flop came down , giving Ott a pair of nines, much to the delight of his rail. Blumstein was well behind now, and the turn brought him no new outs. Blumstein was looking for a two outer now on the river, but that card was the . Ott doubled up to 64 million, while Blumstein is back down below 300 million. The final two players are back at the table and cards are in the air! There will be a short break in the action as the players will have time to take a breather. Hand #237: Dan Ott limped in from the button and Scott Blumstein raised to 8.8 million from the big blind. Ott called and the flop came . Blumstein led out for 7 million and Ott quickly folded. Hand #238: Blumstein called on the button and Ott checked his option. The two players saw a flop of and the action was checked to the on the turn. Ott checked again and Blumstein bet 4.5 million. Ott mucked his cards again and Blumstein took down the pot. Hand #239: Ott limped on the button and Blumstein shoved all-in from the big blind. Ott slid his cards to the muck and Blumstein raked in the pot. Hand #240: Blumstein called on the button and Ott checked his big blind. The flop came and both players checked to the on the turn. Ott led out for 4 million and Blumstein laid his hand down, sending a pot Ott's way. Hand #241: Ott limped on the button again and Blumstein checked his option. The flop was and Blumstein checked the action over to Ott who checked behind. The fell on the turn and Blumstein checked again. Ott checked as well, and the completed the board. Blumstein bet 3 million and Ott quickly called. Blumstein tabled for a pair of eights and Ott showed for a pair of tens. Hand #242: Blumstein limped from the button, and Ott checked his option. The flop came , and Ott checked to Blumstein, who fired 3.5 million. Ott folded, and Blumstein took the hand. Hand #233: Dan Ott limped in on the button and Scott Blumstein checked his option. The flop came and Blumstein checked, as did Ott. The turn was the and Blumstein bet 4.5 million. Ott called. The river was the and Blumstein checked. Ott bet 8 million and Blumstein called. Ott started to push his hand forward, face-down, and Blumstein showed for a pair of threes to scoop the pot. Hand #234: Blumstein moved all in on the button and Ott folded. Hand #235: Ott raised to 6 million on the button and Blumstein mucked. Hand #236: Blumstein limped in on the button and Ott and checked his option. The flop came and Ott checked, as did Blumstein. The turn was the and both players checked to the on the river. Both players checked and Ott tabled for a pair of sixes. Hand #228: Scott Blumstein raised to 6 million on the button, and Dan Ott made the call. The flop came down , and Ott checked to Blumstein, who did the same. The hit the turn, and both players checked again. The completed the board, and Ott checked a third time. Blumstein followed suit, and Ott showed for the winning hand. Hand #229: Ott limped in on the button, and Blumstein checked his option. The flop was , and Blumstein checked to Ott, who checked it back. The came on the turn, and both players checked again. The completed the board, and Blumstein checked a third time. Ott thought for about 45 seconds before betting 7 million, and Blumstein made the call. They both had the straight, as Blumstein had , while Ott tabled , and the pot was chopped. Hand #230: Blumstein limped in, and Ott checked. The two saw a flop of , and Ott checked it over to Blumstein, who checked as well. The hit the turn, and Ott checked to Blumstein, who bet 5.5 million. Ott tossed in the call, and the river was the . Ott checked a third time, and Blumstein fired out 17 million. Ott called, and it was another chopped pot, as Blumstein showed , while Ott had . Hand #231: Ott open folded the button, giving Blumstein a walk. Hand #232: Blumstein limped in, and Ott checked his option. The flop came , and Ott checked. Blumstein bet 3.5 million, and Ott quickly released his hand.